Have you asked yourself how to make the installation of drywall easier when alone? 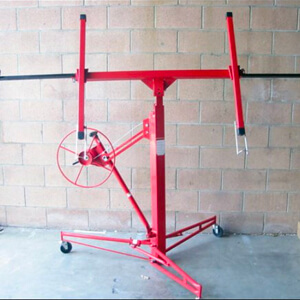 Using the best Drywall Lifts, you can work efficiently with minimal help when installing a new Drywall. 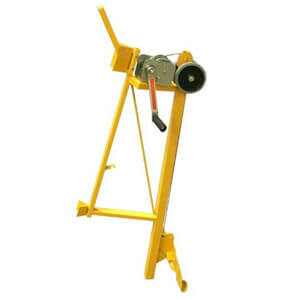 It is the best way to use the least physical strength during construction work. An excellent time-saving tool can carry the weight of drywall sheets that are cumbersome to install manually. You will install a large area in a shorter time compared to installing them manually. These tools are easy to assemble and break down when through with the job. 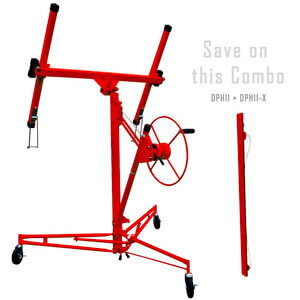 This tool makes it possible to do the job single-handedly, therefore, saving you the cost of labor. This tool is recommended for professional ceiling installers and for home use to fix things around. 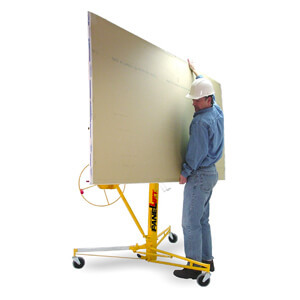 Drywall lifts help simplify the job of lifting the heavy drywall panels off the ground and into the mounting positions. Since the sheets can range from 70 to 150 lbs, these lifts have the build to manage the weight until it is securely placed. Those with wheels make the task even easier since you can move the load from one position to another. It also makes moving the equipment from one room to another quite easy. Based on the amount of time you want to use them, you can buy or rent the lift. It is crucial that you do adequate comparison shopping before taking any action. 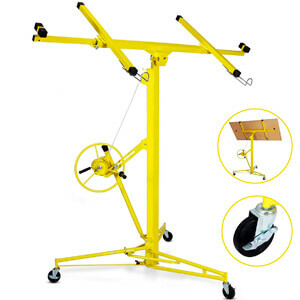 Each project is unique and the requirements vary so will your lifting equipment. 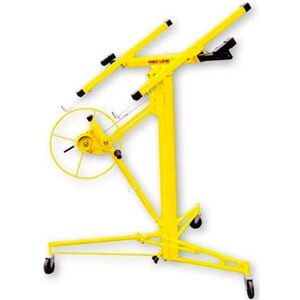 The stronger drywall lifts use a more powerful hydraulic crank to lift heavier boards to the right position for installation. This crank makes your job much easier. It is not surprising that these lifts are more expensive than the basic types. 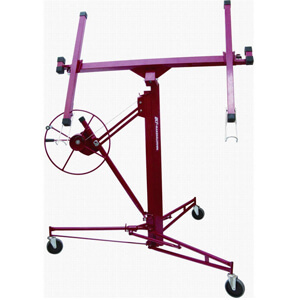 There are the drywall lifts that are battery operated making the task almost effortless. You can easily position the drywall vaulted ceiling jobs. Among the available lifts, the battery-operated ones are the most expensive. Getting drywall panels to the ceiling is no easy task. Professionals struggle to install the panels when done manually with people holding it on their heads. It requires a lot of coordination and may be awkward. You, however, have the option to rent a lift from a local store or buy the best one for the job for large or repeat projects. They are easy to work with. One person can load a sheet, and then crank it up to the right position without any help. The lift will hold the sheet in place as you nail it into position. No more struggling or involving in tiring activities. 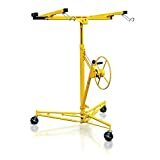 Purchase the model that meets the demands of your job and that which will manage most of your tasks, weight, height, and sizes. Just like reviews from friends around you, consumer reviews on the internet are crucial in the purchasing process. Go through the reviews from past customers and see what positive and negatives they have about the product that interests you. Apart from the customer feedback, they can rate the product on a scale of 0 to 5. A standard rating is three, but some will have four or five for a fine product. Nay rating below three will require your careful and cautious review of the opinions left by the customers. 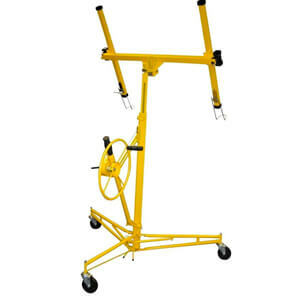 There are many variations in the drywall lift section. Each type and model has a different price, and some may be beyond your budget yet they suit your needs. It is crucial that you go for quality, reliability, and durability instead of just looking at the price tag. Any product that is needed for daily or regular use should be in the higher price range due to the durability. Do not sell yourself short. Most standard lifts are 11 feet in lift height, hence perfect for most homes. 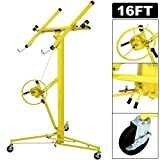 However, for those in need of something that can lift to 15 or more feet, it is important to purchase the right lift. 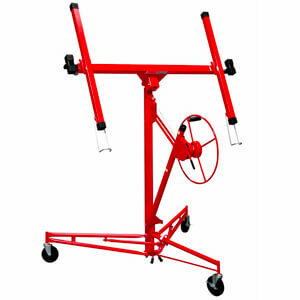 This will manage the lifting tasks in 99% of the homes and projects. 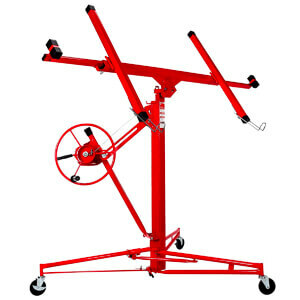 The market has so many choices of drywall lifts to pick from. If you do many contracts, go for the contract grade that can handle up to 150 lbs with ease. This is also ideal for home use and will not disappoint. Even though many people say brand does not matter as long as the product is reliable, you may find it difficult finding what’s reliable. Purchasing off labels carry many risks so stick to known brands with a solid history to read about. You may have trouble reaching the customer support in case you have technical issues or needs to return the product. It is time you make construction duties less straining. Shop for and purchase the best Drywall lifts in the market and increase your efficiency and reduce time and labor costs when installing ceilings. It can help you place ceilings at places that are challenging to reach. This tool allows you to work alone and complete your projects faster. It works well with a good set of drywall stilts and a high-quality putty knife.